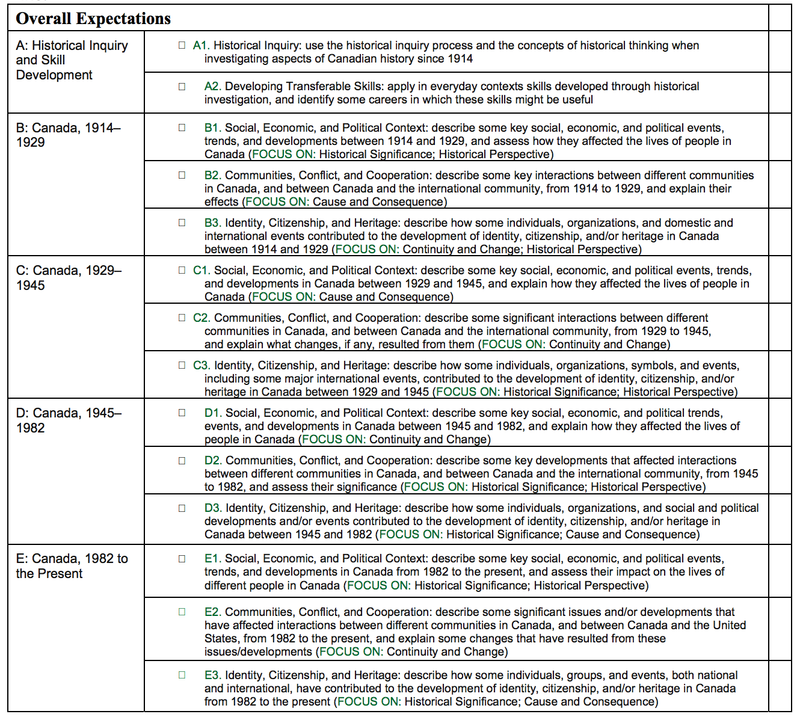 Course Description: This course focuses on the social context of historical developments and events and how they have affected the lives of people in Canada since 1914. Students will explore interactions between various communities in Canada as well as contributions of individuals and groups to Canadian heritage and identity. Students will develop their ability to apply the concepts of historical thinking and the historical inquiry process, including the interpretation and analysis of evidence, when investigating the continuing relevance of historical developments and how they have helped shape communities in present-day Canada. This unit focuses on a pivotal era in Canadian History; the years during and following the First World War. In this unit, students will learn about the perspectives of various regions and groups within Canada during the period. In examining the First World War, students will analyze Canada's participation, and what the country's participation meant for Canada. Students will examine the economic, political, and social impacts of Canada's involvement in World War One.This unit also covers the stock market crash, which resulted in the Great Depression, and Canada's involvement in the Second World War. While studying this period, students will investigate the impact of the Great Depression in Canada, the concepts of racism and anti-Semitism, and how Canada was perceived on the International Stage following the Second World War. The fourth unit in this course covers Canadian history from the end of the Second World War until 1982. During this period, Canada made huge advances in protecting its citizens from economic hardship and human rights violations. Students will analyze changing philosophies regarding the responsibilities of government, and the development of a Canadian identity. This unit will also examine Canada's role in the Cold War and in international politics. The first half of this unit will delve into the tenure of Canada’s Prime Minister Pierre Elliot Trudeau and his vision of our nation as a “Just Society”. The second half of the unit will look at the Challenge of Quebec beginning with the October Crisis and the invocation of the War Measures Act. Students will think about the crisis of terrorism in the 21st century as it relates to these former events. We will trace the rise of the Parti Quebecois and the implementation of new language laws. The unit ends with a defining moment in Canadian history when our constitution was repatriated. RST worth 20% of final mark: Students will produce a Poster and Reflection Paper on a Historical Topic. The proctored exam is worth 10% of the final mark.